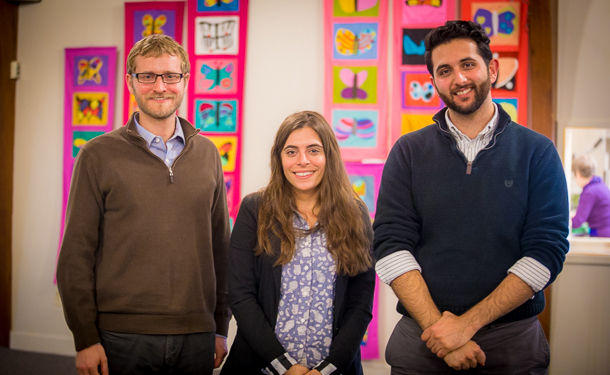 Ahmed Tarik, Jordan Detwiler-Michelson and Myriam Aziz have presented at Park View and Shalom Mennonite churches in Harrisonburg, and they hope to continue sharing in the future. Each has recent experience in Syria or with Syrian refugees. At Park View, the group presented beneath brightly-colored banners reading ‘faith,’ ‘hope,’ ‘love,’ and ‘joy’ and depicting simplistic imagery that contrasted vividly with the evening’s subject matter: a clash between the ideals of faith and humanity and war’s injustice. Born in Baghdad, Iraq, Tarik fled his home city in 2006 due to war. He sought refuge in Damascus, Syria for three years. During that time, Tarik worked as a photographer for the United Nations High Commissioner for Refugees (UNHCR) documenting the life of Iraqi youth refugees in Damascus. Tarik directed attention to what is widely considered by the United Nations and other organizations with a history of involvement in refugee matters to be the world’s largest humanitarian crisis since World War II. “It is not easy to be uprooted from your home for no other reason than violence,” he said. Tarik urged those present not to treat Syrian refugees like a burden, as Syrian families readily opened their homes to his other families fleeing the Iraq war. Detwiler-Michelson, also a second-year graduate student, was one of the last members of Mennonite Central Committee’s team to leave Syria in 2011. The school in which he taught is now, he says, headquarters for Kurdish military forces. The Syrian refugee crisis “exists within a complex and dynamic political landscape,” he said. Using his own photographs of Damascus, Detwiler-Michelson sketched the cultural richness of that city’s ancient history. “What does it mean to leave home when home is where your family has lived for 4,000 years?” he asked. Detwiler-Michelson’s own sense of Damascus as home developed during his sojourn with members of the Syrian Orthodox Church community, ranging from laypersons to the church’s archbishop and his retired predecessor. From these Syrian people, many of whom are now displaced, Jordan says he learned about true service, full joy and the meeting of challenges as a community. In a gesture of solidarity, Detwiler-Michelson played a clip of the Lord’s Prayer sung in Aramaic — a lament that evokes the current suffering his Syrian friends now face. Lebanon, a country of 4 million people, is now home to 1.3 million Syrian refugees, she said. Registering with UNHCR is the only path to legal refugee status for Syrians, but that process is long and rigorous. Aziz used personal photos to show life in the temporary UNHCR camps. She also discussed daily shortages of food and other resources. Myriam Aziz and Jordan Detwiler-Michelson will speak Feb. 28, 2016, at the Harrisonburg Unitarian Universalist Church. Both Aziz and Detwiler-Michelson are available to speak to area organizations during spring semester; Tarik is completing a practicum out of the area. For more information or to inquire about booking a presentation, contact the Center for Justice and Peacebuilding.